What a brilliant workshop we had this morning. 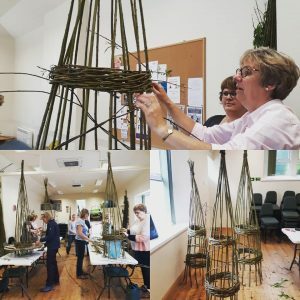 Such an enthusiastic group of weavers making quite frankly massively impressive garden obelisks which involved some interesting manoevering to get out of the hall and into cars (a mini and a golf amongst them!) . Ruth Thompson of Sylvan Skills patiently taught us all three rod waling and the importance of watching out for being whipped in ‘the danger zone’ which happened quite frequently working so closely together! My obelisk is now standing in the Higher Ground garden ready to support some sweet peas, I am chuffed to bits with it.